Posted on Saturday, February 27th, 2010 at 2:00 pm. 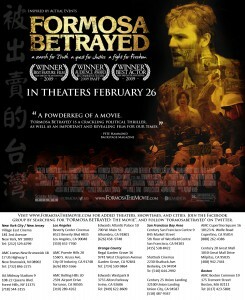 Come find out what the buzz about Formosa Betrayed is all about! After the movie, join us for a fun night of karaoke at Golden Leaf. Come to one or both events and feel free to invite your friends.